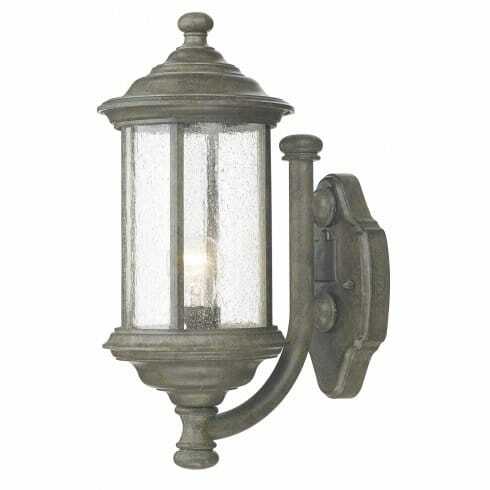 Dar Lighting Brompton single light wall fitting is a fantastic way to add character and rustic charm to any outdoor setting. It features a cylindrical frame with decorative ridged details on its old iron finished frame and the clear glass is seeded for added texture and a weathered effect. A traditional design that will certainly steal the focus and add welcoming warmth to any external setting. IP43 moisture protection rated for safe external use. Double insulated. The product code is BRO1661. Our collection of time-worn outdoor wall fixtures is always expanding and many more designs can be viewed and ordered from our website.